1. Preheat the oven to 200°C, gas mark 6. Place the chicken, onion and pepper in a roasting dish. Mix the hot stock with the pesto and pour over the chicken. Bake for 15 minutes. 2. 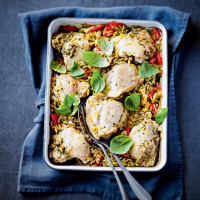 Stir in the orzo and return to the oven for 20 minutes, stirring once or twice until the pasta is tender and the chicken is fully cooked through with no pink meat. Serve scattered with the basil.